For many years, my bedroom was the room where I did much of my study, reading, writing, and thinking. Morning is when I read, meditate, pray, reflect, and work on my current study project. With children in the house and a busy schedule, there was no other time and place to work on my own studies and cultivate my devotional life. Now that my children are grown and mostly gone, I am working every day outside the home so I still don’t have a lot of time. However I still write and read in the morning, and I now have a place for my studies. When we moved into our house, my husband decided that since I was the only woman in a house full of men, it would be a good thing for me to have a room I could call my own. He had our contractor take the back porch and turn it into a room off the back of the house. It’s a jewel of a room. The pale green walls reflect the sunlight that pours in like liquid gold throughout the day. The dark wood floor is covered with an oriental carpet with rich, deep colors, which my father gave me. Family heirlooms dot the room and the wingback chairs are both elegant and comfortable. And, of course, there is a full wall of bookshelves, covered in books of all kinds, so that I have novels to sink into and bits of information right at my fingertips. Virginia Woolf wrote in her famous essay, A Room of One’s Own, that for a woman to write fiction, [she] must have money and a room of her own…. She did not just mean a physical place, but also that one must have leisure as well as mental and emotional space in order to pour out her thoughts onto a page. While I believe that anyone can write in the middle of a busy, crowded room, if necessary, as journalists and other professional writers have learned to do, I also can see what Woolf was implying. In order to write, you must create a mental space to take in information through reading, watching, observing, and then meditate on those things long enough to turn them into your own thoughts. Once those thoughts are formed, they must then be written down in some way. All of this takes time and space and energy, much of which is lacking in busy family life, especially when the children are small. …if I knocked at my mother’s door, she always answered, and if I entered the room, she never seemed to mind. She would put down her pen immediately, and smile gently, and ask what I wanted. However, since my children have grown and moved out into the world to embrace their lives as adults, it has been easier for me to go deeper and further in my thinking and writing. The empty nest has allowed me to acquire the mental and physical space I need work. Having a room with doors that can be closed signals to others that I am in working mode: please do not disturb. I can now fall into what I call the “black hole of research” without being concerned for hungry tummies and skinned knees. It doesn’t mean that the men in my house always pay attention to that closed door (which is why I still get up before everyone else in the mornings), but it does help me to feel less conflicted and less likely to be interrupted, which allows me to more freely pour out what I want to communicate. Long stretches of time are still scant, but with careful planning, I can often find corners of time and sometimes even a few hours to gaze out the window, read beautiful prose, chase down my myriad of thoughts, and write what’s in my heart. A room of one’s own—what a luxury and a comfort to have this place of beauty in which to work and think and ponder the important things of life. This room, this jewel, is in the top ten of things for which I am thankful every day. I have a variety of interests and therefore tend to read books of many genres and follow several blogs that touch on different topics. Some of the blogs I have been following for years and some I have just recently discovered. The posts that have most resonated with me this past week are here and here. 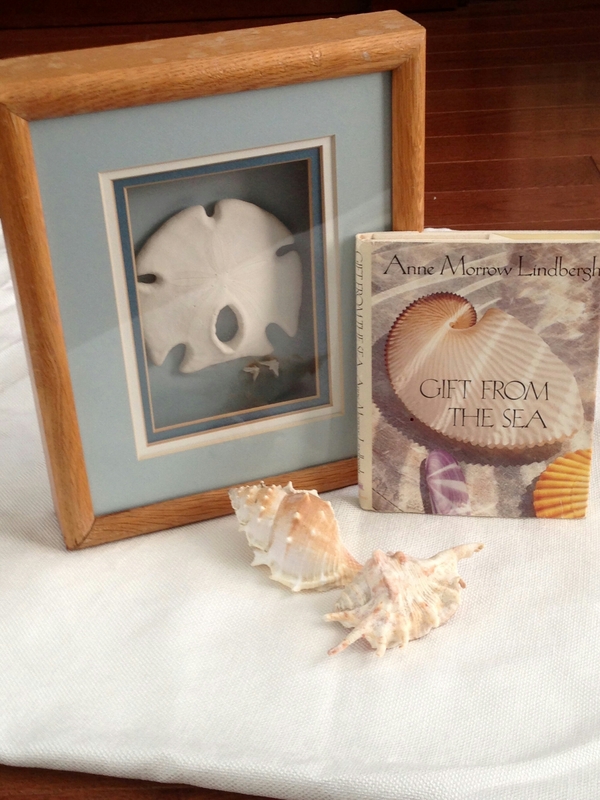 The first one on solitude was especially timely as I have been listening to A Gift from the Sea by Anne Morrow Lindbergh, in which she talks about the importance of finding an hour a day of solitude and silence in order to maintain the wholeness that is so difficult to find in the midst of the many, many requests for our time and energy each day. I have personally found that without at least a few minutes of contemplative time for prayer, reading, and thinking, my mind and heart can easily crumble in the onslaught of the mass of “to do’s” and “oughts” each day. However, when I take that hour or even fifteen minutes to stop, to think, to pray for strength and wisdom, then am I able to meet the onslaught with grace, knowing that my Good Shepherd is leading and will supply my every need in the midst of life’s demands. Let me encourage you to carve out a few moments of solitude today to think, to pray, to read Scripture, to life your heart in thanksgiving for all of the blessings in your life. Even if the only solitude you can get is the three minutes in the bathroom while the baby and toddler are in the playpen (I remember those days!) it will be worth it, I promise you. Linda also had posts on Scripture reading plans and journaling, which were thought-provoking and wise. I hope she speaks to your heart as she has to mine.